This app helps players to choose Australian Powerball winning numbers with an algorithm, UNIQUE IN THE WORLD for Australian Powerball Lottery draws. Generating two-dimensional and Even/Odd Australia Powerball winning numbers. 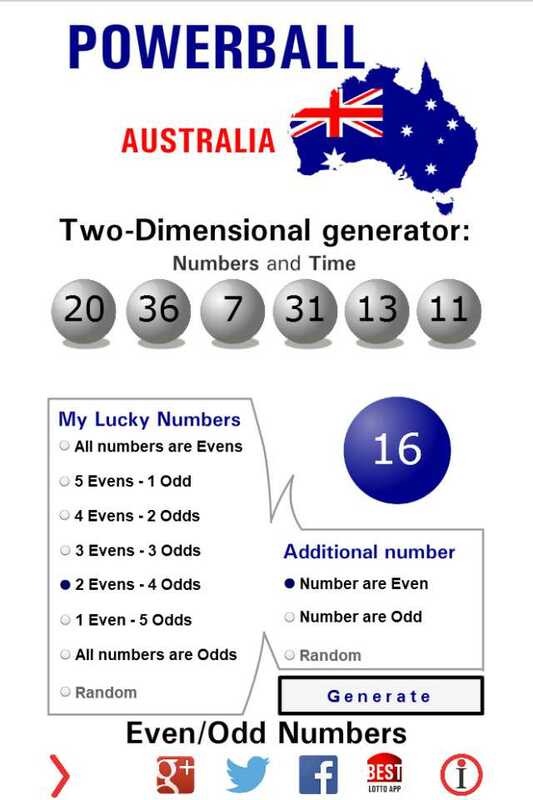 It is suggested to select your Australian Powerball winning numbers with utmost care. Similarly, sequential numbers having same ending like 2, 12, 22, 32 and so on can never make you hit the Australian Powerball jackpot. In this case, generate other Powerball winning numbers. Play Australian Powerball numbers with the best code generator in the WORLD! We have developed what we believe to be the most unique lottery number generator apps in the world. Only our lottery apps use our exclusive two-dimensional algorithm for generate lotto numbers. This app helps players to choose numbers for Australian Powerball lotto draws. You can choose how many even and odd numbers to generate and play. If you play the Australian Powerball Lottery then you owe it to yourself to check out our Powerball Number Generator app. Our Powerball Number Generator app is unique because unlike similar apps ours is truly random. Only our PowerBall Number Generator app uses a unique two-dimensional algorithm that generates time as well as the numbers. We give you every option to adjust your number selection criteria such as an even or odd numbered Powerball number or you can specify the number of regular numbers that will be off or even. We recommend that you leave the app set to random results but the choice is yours. The new Australian Powerball since March 2013 draws six regular numbers from one pool of 40, with the Powerball drawn from a separate pool of 20 numbers. There are eight cash prize divisions, with the jackpot starting at AU$3 million. The top prize regularly rolls over to much bigger amounts and often reaches eight figures. There are prizes available for matching anything from two numbers and the Powerball upwards. Your chance of winning depends on the number of games that you purchase on your ticket. The chance of winning a Division 1 prize in Australian Powerball is 1 in 76,767,600 for a single-game entry. Odd numbers are those which end in 1, 3, 5, 7 and 9 while even numbers are those which end in 0, 2, 4, 6 and 8. You are more likely to win if your odd-even number combination is either 2-4, 3-3 or 4-2. More than 60% of the winning combinations in Australian Powerball Lottery in the past two years are in these category. This application has no link in no way with Australian Powerball Lottery organism and it does not allow to participate in the official game of Australian Powerball Lottery.